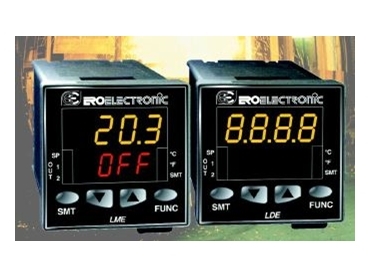 The LDE temperature controllers include self-tuning control. ERO Australia has introduced the new economical LDE 1/16 DIN standard temperature controller. The compact panel mounting model LDE [1/16 DIN (48 x 48mm)] uses advanced PID algorithms to provide stable 'straight line' temperature control. Self-tuning is included to optimise the control performance without the need for specialist knowledge or training. The PID control mode can also be switched off for ON/OFF control, or to change the module to an indicating alarm. To eliminate the need for a zone switch, a "turn off" function is provided to switch off the output control and alarm function. In this mode the module acts as an indicator monitoring the process. A bumpless transfer from off to control is initiated on reactivation of the control function. This feature allows for energy saving in batch processing as well as a simple safety monitor for operators. A universal temperature input allows for inputs such as thermocouple (J, K, T, L & N) plus Pt100 inputs. This allows the one instrument to be used for all standard temperature inputs. Universal power supply options of 100 to 240V ac or 24V ac/dc allows the LDE to be used with power supplies worldwide. One or two outputs are available for heating, cooling or alarm functions, which are set via front accessible tactile buttons ensuring positive operation. The LDE outputs can be setup for either control or alarming. Used as alarms, the outputs can be configured to activate as high, low band or deviation alarms, with adjustable deadband. The alarms can also be configured to activate only after the process has reached its operating condition, to eliminate start-up trips. Outputs can be either voltage free relays or logic outputs for driving power switching modules such as solid state relays. An IP65 rated sealing allows the LDE to be installed into harsh industrial environments. The 4 digit display and 4 function button user interface combined with simple setup procedures allows for fast commissioning, with auto-tune provided as standard for loop optimisation. The simple menu for the LDE provides a convenient and exact method for setting parameters such as new input calibrations, without the need for simulators and sources. The cost-effective, simple-to-use LDE controller provides an ideal process control solutions for applications such as simple heating and cooling, small ovens, chillers, sterilisers, trace heating, heat sealing and injection moulding.